Rumors about Scoot McNairy’s Batman v Superman character resurface again. 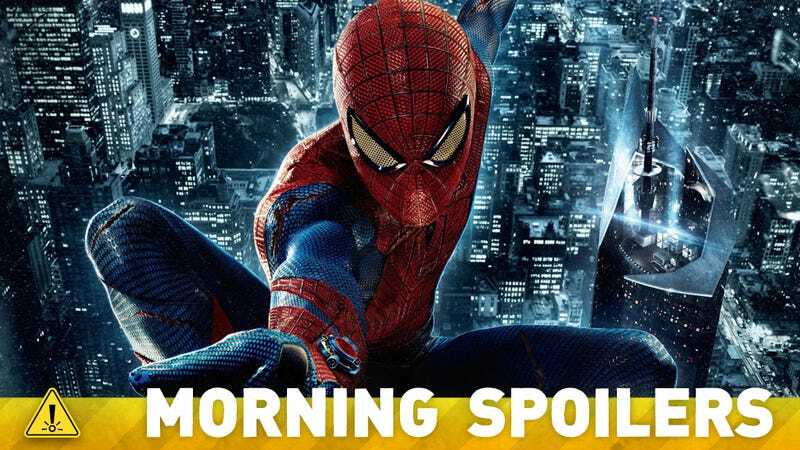 Spider-Man may have a bigger role in Civil War than previously thought. Charlie Hunnam wants less spectacle in Pacific Rim 2. Plus, Ron Perlman still wants Hellboy 3, and Legends of Tomorrow casts a new DC superhero. Spoilers! How many scenes will Spider-Man be in? I don’t know the exact number, but sources have recently made it clear to me that there’s more Spider-Man in this movie than I expected. Spider-Man doesn’t just swing by and say hi - gets his hands dirty in this Civil War. He fights. And his fight scene might be the one that really gets fandom excited - not because of how top tier the face-off will be, but because of how profoundly dorky and unlike any other big screen superhero fight it will be. So for the record: Peter Parker will have a cameo, while Spider-Man will have a few scenes and at least one fight that will be jockeying for a spot on the best superhero battles ever list. We want to explore the fact that just because you get superpowers doesn’t really make you into a sophisticated, successful adult. He’s still a kid, and he’s clumsy, and he’s a geek, and he’s a bit of an outcast. And in many ways, the superpowers amplify that, and exacerbate his trying to fit in. He has one more secret that he has to keep from the world, one more burden that he’s dealing with, above all the other crap that he’s dealing with at school. So it’s going to be fun. Rumors are once again swirling that Scoot McNairy is playing a double-amputee Jimmy Olsen, this time with Heroic Hollywood allegedly backing up the year-old rumor with new sources confirming it to be the case. As ever with anonymously sourced rumors, take it with a pinch of salt. I got no problems with forcing the conversation, as you can tell. We’re in the business of moving mountains. Those of us who are used to working in mainstream film and television. Don’t come to me with details and problems. Just tell me how we move the mountain. I think world creation and monster creation and all of that stuff is exciting as a secondary element of storytelling. When it becomes more important than storytelling, I get very nervous, and you sort of lose me a little bit. Although we tried very hard on Pacific Rim to marry those two elements, I do feel like ultimately it got weighed heavier on the side of spectacle than storytelling. I hope that we are able to remedy that a little bit going into the second. Not to say I wasn’t proud of the film. I really liked it, and I felt like it delivered exactly what it was supposed to. But I do feel like we could have maybe plumbed the depths of the character and the storytelling a little bit more. Here’s a slightly different version of the previously released clip from the film, featuring Kate Mara’s Sue Storm. There won’t be any Headless this year, but we have a new framework and a new set of rules for the mythology. And it all starts with the introduction of our new big bad and will take us into a very interesting device which will allow us to see a somewhat more compelling, but more personal threat to both Abbie and Crane. The main difference I would say, the only temperature change moving it from Victorian and Modern is ghost stories work better in the Victorian setting,” Moffat said. “Doyle stories that are scary chillers we haven’t done much. Victorian era gives us a chance to do a creepy one, a scary one. Please attempt to get hooked on a feeling once more with a new trailer for the show. Los Angeles burns in a new teaser for the show’s upcoming premiere. Finally, the inmates run the Asylum in a brief new UK teaser for season 2. Additional reporting by Gordon Jackson and Charlie Jane Anders. Top image: The Amazing Spider-Man.